March 21, 2008 Albuquerque, New Mexico - After the Big Basin craft, no other photographs of the mysterious dragonfly-shaped drones emerged in 2007. But on Tuesday, June 26, 2007, the mystery of the dragonfly-shaped aerial drones took another turn with the release of an alleged secret report containing photographs of alleged extraterrestrial technologies, entitled “Commercial Applications Research for Extraterrestrial Technology” – known with the acronym CARET, which contained a “Q4-86 Research Report,” dated December 1986, Palo Alto, California, by the Palo Alto CARET Laboratory, also known as PACL (pronounced “packel”). See: Isaac Release and 062607Earthfiles Parts 1 and 2. 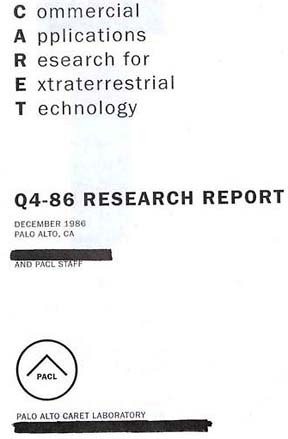 Cover of CARET Q4-86 Research Report, December 1986, Palo Alto, California, and PACL Staff, Palo Alto CARET Laboratory. Document provided by "Isaac" electronically on June 26, 2007.